I’ve temporarily swapped the New Zealand winter for the northern hemisphere summer (though as I type it’s a cool, rainy day in Yorkshire) and I’ve done a bit of vintage textile sightseeing while I’ve been here. One of the first things I did in London was visit the Fashion and Textile Museum in Bermondsey Street (http://www.ftmlondon.org/). It was founded by British designer Zandra Rhodes – you can learn more about the background story here. Most of the previous exhibitions have been about fashion but the current one concentrates on fabric. Very Sanderson – 150 years of English decoration surveys the history and production of the iconic (and I think this over-used word is deserved in this case) textile company Sanderson. The wallpapers and fabrics are largely displayed chronologically and are accompanied by large panels which give a summary of the company’s history and main achievements during each period. This is also replicated in the exhibition booklet which came with the entry fee – this will be a handy little source of information in the future I think. 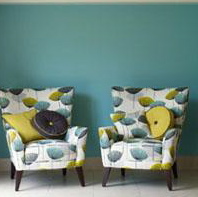 The real treat is the wallpapers and fabrics themselves, which were loaned by the Sanderson archive for the exhibition. 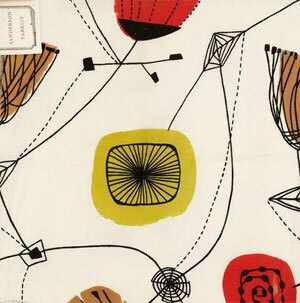 It was wonderful to have fabric that I’ve only seen in books and online before my eyes, the aforementioned Lucienne Day especially. Fabrics from the 1920s to the 1970s were displayed in large drops on one wall. 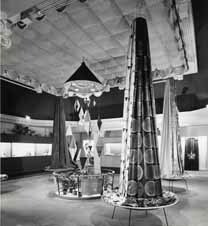 In the centre various fabrics were arranged in a cylindrical drop, which is how they were displayed in Sanderson stores as shown at left. The 1980s chintzes were displayed on the floor above, along with ‘log books’ from the late 19th and early 20th centuries, which contained strips of wallpaper produced by various companies eventually absorbed by Sanderson. These books included the pattern name, notes about the designers and cutters and the cost of this work. I thought it was odd to display such different artifacts from distant periods alongside one another like this – but I guess the log books were not strictly Sanderson so wouldn’t have fitted with the earlier pieces on the floor below. 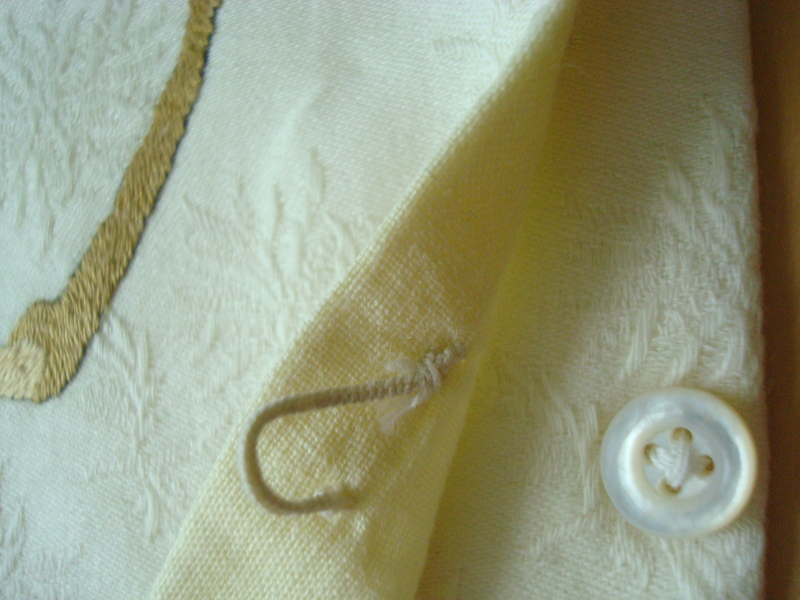 Nearby were made-up curtains and upholstered couches and chairs which demonstrated patterns currently available. I really like Dandelion Clocks (below), designed for Sanderson by Fiona Howard in about 2009. It references the motifs and style of the mid-20th century without feeling too derivative. The one real criticism I have of the exhibition is the lack of information of the designers, whether in-house or contractors. It wouldn’t have been hard to have a panel about Lucienne Day for instance, and I would have been pleased to learn more about less well-known people. Luckily the visual feast helped me to get past this deficit. The next couple of exhibitions here also deal in fabric. If you find yourself in London add this museum to your to-do list. I had also hoped to get to the V&A’s Quilts 1700-2010 but so far train cancellations and flight delays have thwarted me. I have a small window of opportunity in a couple of weeks though so fingers crossed! Check out http://www.vam.ac.uk/collections/textiles/quilts-1700-2010/ for a slice of this. Now, in a complete and random (but hopefully pleasant) departure from what I’ve been talking about, here are some photos of two cute pieces I bought at a market in Aix-en-Provence in France for €5 (about NZ$10). I think they are handkerchief holders or something similar. Knowing about 10 words of French was not helpful at the time of purchase. This one is made of beautifully soft cream embossed cotton. 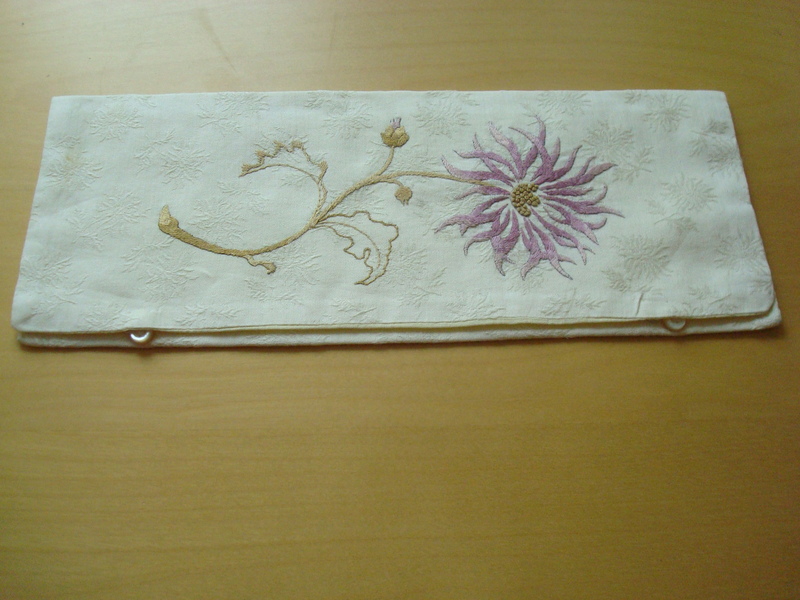 The flower is exquisitely embroidered – the maker didn’t put a finger wrong. This specimen is much more work-a-day. 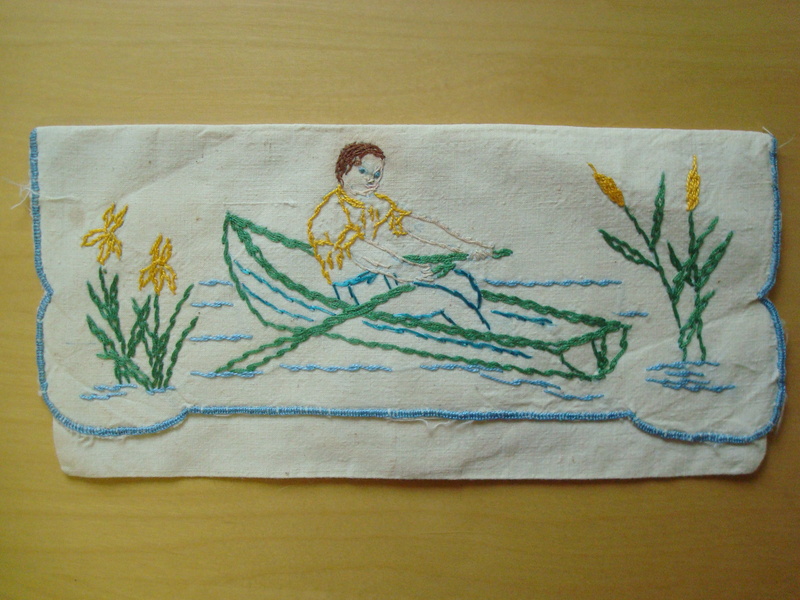 It’s rough calico and the embroidery can be similarly described, but I quite liked the wee rower all the same.